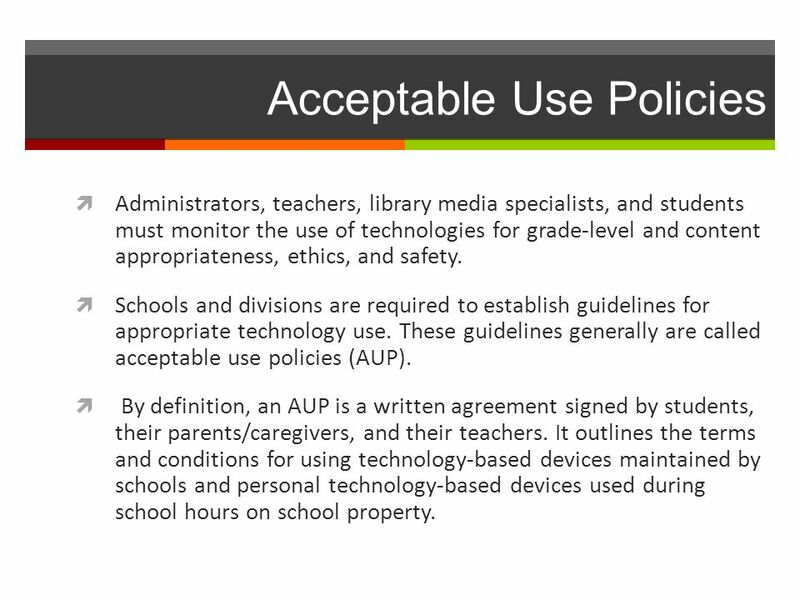 An Acceptable Use Policy (AUP) outlines how a school or district expects its members to behave when using technology. An AUP defines acceptable behavior for using hardware and information systems, such as the Internet and appropriate networks. The following is an exapmple of an Acceptable Use Policy that the student, parent(s), and teacher must sign. This document is for the clarification of acceptable use of the technology in our classroom. We will be discussing this policy and following it closely throughout the year. Any misuse of the following guidelines will result in the loss of privileges with the use of technology in our classroom. Students will use the computers/technology as instructed to do so by the teacher. Students will treat the computers/technology with respect. Students will not be permitted to run in the room, physically misuse the equipment, or any other form of misuse. Students must stay/work with the group and only go to the site(s) that they are instructed to access. Students may not go to chat rooms or use Instant Messenger programs. The teacher will check all in-coming and out-going e-mail messages before students will have access to them should we use e-mail in the classroom. Depending on the circumstances, you will not be allowed to use the computer for a day, a week, a month or the entire school year. However, you will be required to complete any projects using paper, pencil and books. A letter will go home to the parent from the student and teacher explaining the error in judgment and consequence. The student may not use the computer at the end of the consequence time period if the letter has not been signed by a parent and returned to the teacher. I accept these expectations and consequences and have discussed them with my family.